I'm great about making sure that my two boys eat a healthy, well-balanced breakfast every morning. However, I am not so great about following my own advice. I tend to get involved in 5 different things every morning and completely forget to eat until lunch rolls around. One of the problems that I run into with breakfast is that the only thing I really like eating is toast or something starch based. I have tried cereal and honeslty, I prefer it as a snack rather than a breakfast food. So every morning Im stuck trying to figure out what I want to eat and normally failing miserably. A couple of months back I had a number of ingredients left over from a previous cookie recipe, so I decided to make scones and try to change up my breakfast routine. I place the first four ingredients in the food processor and pulse until the mixture is coarse, but not full of butter lumps. Transfer to a bowl and add the last three ingredients. Hand pat the mixture into a circle and cut into 8 wedges. Brush the tops with additional heavy cream and sugar if desired. Bake at 425 for 10-15 minutes. 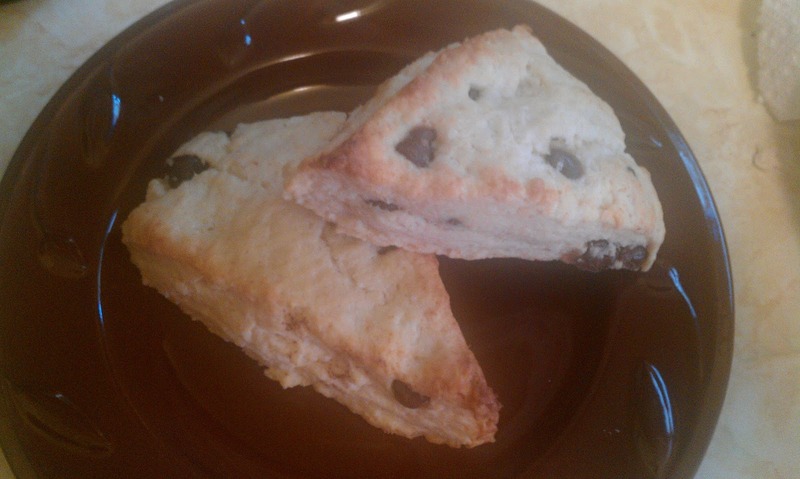 These scones turned out well. I liked that they combined coconut and chocolate, two of my favorite flavors. 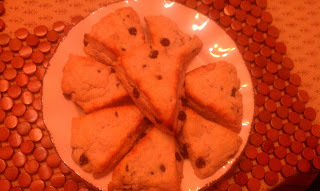 Since these recipe only made 8 scones they only lasted a couple of hours in my house. Next time I think I will make a double batch. Overall, a very simple and easy to prepare breakfast recipe. That looks so good. I've never made scones before though. I might have to try. OMG these sound so good!! Thanks for stopping by and the nice comments. I'm following you as well =) Happy Wednesday! I love scones. Those look delicious! Yum! What a great flavor combo for scones! Oh my goodness! These sound sooo yummy! :) Following you back from the Wired Wed. blog hop. Have a great week! How nice with a cup of coffee! Yum! These look yummy! I will definitely have to try them sometime, thanks for sharing the recipe. Here to follow back, thanks for stopping by my page and for the comment. Have a wonderful day! Oh Yummy! I want them right now for breakfast! What a great combo idea. I'm always nagging my kids about breakfast, telling them it's the most important meal of the day! Thanks for commenting on Mom's Home Run! Oh Yum! Chocolate and coconut is one of my favorite combinations for sweets! If I baked I would make these!